Picture yourself beside a roaring fire on a cold winter’s evening, as the warming aroma of winter berries and spice fills the air. Our Frosted Berries pure wax luxury candle creates a nostalgic and welcoming fragrance throughout your home – lifting your spirits on even the coldest and darkest of winter’s nights. Nestle beside the welcoming flicker of our Frosted Berries candle, and enjoy the rich aroma of mixed winter berries and hand-selected festive spices. We’ve combined the scents of blackberries, red currants, and sloes with classic spices like nutmeg, cinnamon, and allspice, infusing our pure wax votive candles with a nostalgic and inviting festive aroma. Nothing is more satisfying on a chilly winter’s day than coming home to the spirit-lifting scent of our Frosted Berries candle. We’ve worked hard to perfect the festive fragrances in our Winter Wonders collection, helping you set a comfortable and warming mood throughout the long winter season. 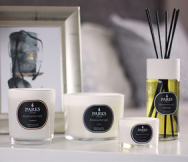 Using 100% natural ingredients of the finest quality, our winter candles and diffusers offer the utmost in festive charm and luxury for your home – keeping the magic of the festive season alight until the warm days of spring arrive. Our Frosted Berries candle offers up to 50 hours of burn time, and benefits from our clean burn and soot-free wick system. We only use pure natural wax in our candles, so you’re guaranteed effective and long-lasting fragrance from burn to burn. Supplied in a luxury gift box, the candle is a great choice for spreading a little festive cheer at this enchanting time of year.